How can I let my GP practice or a community service know my choices? The next time you see your practice or service they may provide you with a leaflet about your sharing choices, or they may ask you verbally. If you would like to have your choices recorded sooner, you can download the leaflet below, complete the form and hand it in to the reception at the practice or service. Remember that not all practices and Community services use SystmOne. If you are not sure if your GP practice or service uses SystmOne, please contact the Patient Experience Team on 0800 279 2535 or capccg.pet@nhs.net to find out. Can I change my mind about sharing my record? Yes. You can change your mind at any time. Let each practice or service know if you want to change your original choice. You can download the consent leaflet from this site to fill in your choices and give to your practice and services caring for you. 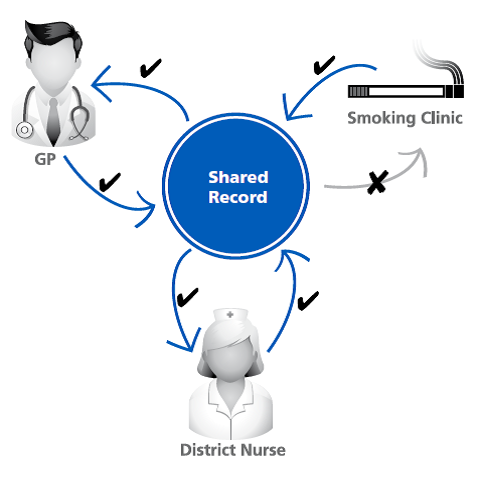 I am happy to share my record with other healthcare services in general but there are some things that I would prefer to keep confidential between me and my GP. Can I do that? You can request that individual items on your record held at any service be marked as Private. When your full record is shared, the Private information will not be visible to any other service. Will other services be able to see everything on my record? If I choose not to share my record will other services involved in my care be able to see any of my medical information at all? Yes, if you are cared for by some services (Child Health care services, Health Visitors, School nurses and District nurses) they will be able to see what vaccinations you have had. In a small number of cases some patients may have a special note added to their record to ensure that urgent care service such as out of hours are immediately aware of a key piece of information to ensure your care is appropriate. For example, patients who may have an End of Life care plan in place may have a special note added to ensure that clinicians are aware of this. You will usually be asked for your permission to add these special notes. This special note will be visible to other services even if you have not decided to share your record or have not yet been asked about your choices. In some circumstances, where a child’s safety may be at risk, their information may be shared with other health professionals caring for that child. If I haven’t chosen to share my record and I have a medical emergency will the services treating me be able to access my record? If you are being treated by a service that uses SystmOne certain clinicians will be able to override your refusal to share either with your permission or, if you are unable to give your permission, because it would be in your best medical interests to do so. Any override of your sharing settings will be monitored to ensure that it is appropriate and done in the best interests of your care. Is the leaflet available in other languages or Braille or Easy Read format? The leaflet will be made available in some languages and a Braille leaflet can be provided on request.